There are numerous ways to get our dose of CBD, one of the most popular being CBD edibles. You’ve probably heard the “I ate too much of the delicious chocolate brownie and freaked the eff out” stories quite a few times. But, these stories would be referencing THC-infused brownies or edibles, not CBD edibles. The effects of CBD edibles aren’t as noticeable when compared to THC edibles, and you will not feel high or “trip out” in the traditional sense of the phrase. CBD edibles are enjoyed for their healing effects. You will likely feel your anxiety calming, pain lessening, and your body relaxing after consuming CBD. Often you will also notice that you become more focused on the present moment as your anxieties and pains fade away. The point of consuming CBD edibles isn’t to alter your state of mind but rather remove the body’s distractions to bring yourself back to a fuller and more complete version of who you are. Whichever way you choose to consume CBD, there is no denying its unmistakable proven benefits. Edibles are a great choice for those who are after the beneficial properties of cannabis and its active components, like CBD, but don’t want to vape or smoke it. CBD edibles are often pocket-sized, they travel well, are convenient, contain an exact and pre-measured dose of CBD, and some are incredibly tasty and fun to eat. Also, the effects of ingesting CBD last significantly longer than smoking or vaping. Over the last few years, CBD-infused edibles seem to have emerged everywhere. Today you can find CBD in everything from bitters and gummies to honey and chocolate bars. We don’t see this trend fading out anytime soon, with medical science backing up the overwhelming anecdotal evidence in favor of CBD. When it comes to the effects of CBD edibles, we only need to look at the health benefits of CBD itself. Various studies have found that CBD decreases inflammation, can be as effective as anti-anxiety pharmaceuticals in reducing stress and anxiety, and even helps to boost gut health. The best CBD edibles are made from full-spectrum hemp extract, which means that they have the added benefit of containing a balanced array of compounds from the whole plant. 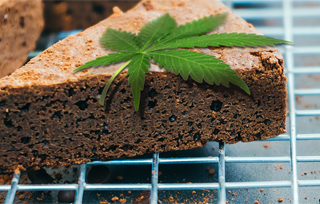 CBD edibles are available in an array of delicious and colorful consumables to satisfy the sweet tooth, ranging from cakes and cookies to oils and even lotions are making waves in culinary circles. But of all the CBD edibles for sale, candy is king. The one that most people know of and tend to remember is CBD gummies. You can buy CBD edibles online, but it’s important that you buy from reputable and legitimate manufacturers who have transparent extraction methods and offer quality, natural, and preferably even organic products that are naturally flavored. There are some extraction methods that may carry through some dangerous chemical residue down to the final product, so always ensure that the CBD edible that you buy is free from pesticides and synthetic chemicals. CBD is useful in many ways, one of the most popular being pain relief, especially when it comes to pain as a symptom of greater conditions like arthritis and multiple sclerosis. When it comes to choosing the best CBD edibles for the pain, your decision will depend on multiple factors, including the severity and cause of your pain as well as your body mass index and more. The standard dose that should be used to treat pain is usually somewhere between 2.5 mg and 20 mg. Because this is such a broad span, you will need to do some research to find the correct dosage for you. If you have never taken CBD before and are unsure of how it will affect you, you should start small with a low dosage and work your way up. 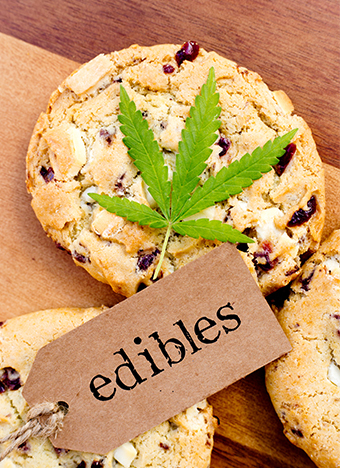 In cannabis terminology, edibles are any foods such as cookies, candies, or brownies that contain CBD and/or cannabis. CBD edibles are, of course, any of these food items that are specifically CBD-infused. For many people who want to consume CBD, edibles are an easy alternative when compared to other routes of administration like smoking and vaping. Also, some people prefer not to consume their cannabis in whole leaf form, simply because they either don’t like the taste or may have respiratory issues that prevent them from inhaling vapor or smoke, etc. When making cannabis edibles, there are typically two ingredients that can be used; cannabis and a CBD isolate. Both THC and CBD are present in cannabis edibles and therefore have psychoactive effects that depend on how much cannabis was used. CBD edibles, on the other hand, contain little to no THC and thus have no psychoactive effect. So are CBD edibles legal? Unfortunately, this question isn’t so easy to answer. While the United States is moving in the right direction, the legality of CBD as a whole is still very much unclear because of different laws in different states, and also even different laws at federal and state level. However, CBD from hemp is now legal in all 50 states. In other words, if the CBD is hemp-derived, meaning that it doesn’t contain THC and has no psychoactive effects, then the related CBD product is considered legal across America. However, bare in mind that in some states, CBD may only be legal for medicinal use. This means that you might need a medical marijuana card to purchase your CBD edibles from a dispensary. Depending on what you are using CBD for, you may opt for edibles that are higher in CBD. After all, bigger doses of CBD can be a very medicinal experience, especially for people who suffer from intense pain, any sort of wasting disorder, or the side effects of cancer treatment. Often, a high dose of CBD can be just the thing needed to get a patient eating again or laughing and smiling. While you should always exercise caution, working up to higher doses is a smart idea and can work wonders for your bodily systems. Another interesting concept that you may or may not have heard of is CBD oil edibles. This is a very convenient option that can be incorporated into all sorts of foods, including sauces, cookies, or maybe even used as a salad dressing or added to your favorite dish. 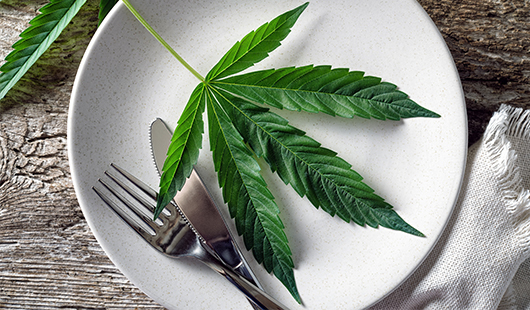 It’s one of the most versatile ways to consume CBD as an edible and is a great way to add your CBD oil into your everyday cooking. Lastly, one of the most popular and loved forms of CBD which is none other than CBD edibles gummies. They’re one of the most delicious ways to enjoy the natural benefits of CBD and the favorite choice for many people looking to get their dose of CBD. They’re available in different dosages and sizes and very discreet in that it looks as though you are eating candy, except for the fact that they are CBD-infused. CBD, otherwise known as cannabidiol, is one of the chemical compounds found in cannabis and is completely non-psychoactive, meaning that it won’t get you high. It does still have an effect on your body, but a much milder one when compared to THC, the notorious psychoactive compound of cannabis. So what happens once you ingest your favorite CBD edibles? As you might know, the human body consists of an endocannabinoid system (ECS), with multiple receptors spread throughout the body and brain. THC activates the CB1 and CB2 receptors, while CBD on the other hand doesn’t directly stimulate either of these receptors. This is also the reason why THC makes you high and CBD doesn’t. The ECS is responsible for regulating many activities in the body such as sleep, appetite, memory, mood, and the immune system. But what does all this have to do with the CBD edibles experience? Well, CBD works by balancing the ECS out, therefore encouraging its therapeutic benefits. 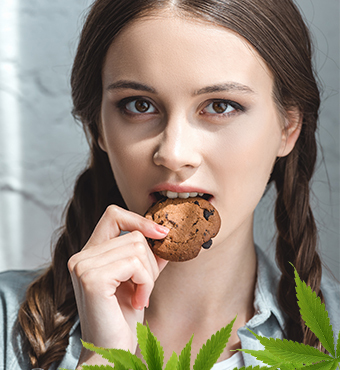 As the edibles travel throughout the body, they release the CBD that soothes the ECS, halts traces of anxiety, stress, and depression and will eventually make you feel wonderfully relaxed. The great thing with CBD is that you feel dazed without feeling confused. Ultimately CBD edibles for anxiety is a real thing. A 2015 analysis that was conducted on previous CBD studies found that CBD is a promising treatment option for various forms of anxiety. But this isn’t the only study to conclude this: Plenty of research has found CBD to be effective in treating anxiety. Another thing to think about is CBD edibles for pain. The great thing about the effects of CBD edibles is that they are long-lasting. Unlike vaping which takes effect almost immediately, or tinctures which act quite quickly, edibles take a little while to kick in. And when they do, the effects are there to stay for a good amount of time. CBD is thought to have potent anti-inflammatory properties which are why it works so well to manage pain. However, if you are after a more quick-acting effect to relieve pain, then you might want to opt for another form of CBD rather than edibles. Now comes the fun part: How to make CBD edibles. But before we look at that, let’s answer a very important question, do CBD edibles get you high? As we have already briefly discussed, CBD is non-psychoactive which means that it won’t get you high. Effectively, this means that CBD edibles won’t get you high. CBD will make you feel relaxed and have you feeling incredibly serene, but it will never get you intoxicated in the same way that THC does. As we mentioned earlier, this is the reason that CBD edibles are legal across the U.S. Step 1: Use 8 tbsp of your selected oil (coconut, olive oil, etc. ), or a bit of butter and put it in a pan. Step 2: Heat the stove and try to keep it to the low 320-356°F boiling points; this is to ensure that the CBD doesn’t evaporate. Step 3: When the stove is warm, put the pan on top and stir until the oil is warmed or th butter is melted. Step 4: Add your CBD oil to the mix. Step 5: Use a spoon to mix the concoction thoroughly. Step 6: You can either use the entire mix or store in a cool, dry place to use at a later stage in one of your favorite dishes. If you would rather buy CBD edibles, then you aren’t short on options. Some of the best CBD edibles online are sold by Green Roads, Purekana, and Hemp Bombs. Here’s all to know about these brands of CBD edibles. The most popular Green Roads CBD edibles are their gummies. They have come up with a few different gummy options including gummy bears, CBD Froggies, Fruit snacks, and sleepy Z’s. The gummy bears are packaged with 30 bears per container, with each bear containing 10 mg of CBD. The froggies are available in three options; 100 mg, 200 mg, and 300 mg packs. The fruit snacks consist of fruity flavors, and you get 20 per bag, while the sleepy Z’s are great for anyone who has insomnia. The Purekana CBD edibles consist of only one option, and that is their CBD gummies. They are vegan and GMO-free and are available as 500 mg of CBD per bottle, with 25 mg of CBD per gummy. They have been designed to help you relax after a long day. The Hemp Bombs CBD edibles consist of gummies, syrup, and a chill shot. The CBD gummies are available in different sizes ranging from 5 to 60 per pack. Each gummy contains 15 mg of CBD. The syrup is a good option for anyone who would prefer to drink, rather than eat their CBD. They sell a 100 mg, 300 mg, and 1000 mg option of the syrup. The Hemp Bombs chill shot is the most immediate way to feel the benefits of CBD. It contains 75 mg of organic CBD along with other all-natural ingredients. If you are after cheap CBD-edibles, then you need to do your research and ensure that you are still buying a legitimate brand and product. Unfortunately, there are many scams and gimmicks out there that are just trying to make money off of people and offering no real value. Know what you are looking for and do your homework on which brands you can trust and which you should avoid. Katie from Ashburn just bough! Derek from Ashburn just bough!